Believe it or not, the time of year when you get divorced can have an impact on your tax filing process. If your divorce occurs in the middle of the tax year, it can complicate your tax returns when filing season rolls around. Additionally, if you claimed homestead exemption, paid property taxes, or deducted mortgage interest from your joint taxes while married, these property tax deductions and exemptions may not follow you after the divorce. Before you get a letter from the IRS, learn how to handle divorce and property tax deductions and other tax considerations following your separation. Remember that a reputable accountant or tax professional is the best option to ensure you properly file your returns. Ideally, one spouse in a divorce will allow the other to take the property tax and mortgage interest deductions. Unfortunately, because these can be substantial breaks on owed taxes, spouses often end up fighting over who has the right to these deductions. The following three points need to be remembered when dealing with divorce property deductions. The spouse that ends up with the house does not necessarily obtain the right to claim the deduction for the first tax year if both spouses jointly owned it for a portion of that year. Both spouses cannot claim the same full deduction (the IRS checks this and will find out eventually). The right to claim these deductions is not split automatically half-and-half among spouses. Typically, the spouse who can prove that she primarily paid for the mortgage and property taxes out of her own funds is the one who wins the right to claim the deductions. This is often easy for couples in which one spouse was the primary earner in the household but more difficult for spouses of equal earning capacity. If neither spouse can prove his or her larger contribution to the property expenses, the IRS may allow each spouse to claim half of the deduction. Georgia’s equitable distribution property laws say that all marital property is subject to division. 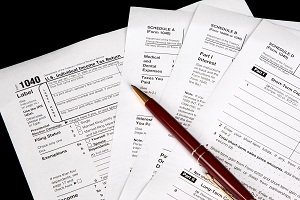 This means each type of tax deduction may be different, depending on your personal situation. Child custody plays a role in determining whether or not you can claim a tax deduction for a dependent. If you have primary custody of your child, you are generally able to claim the exemption. However, if your income is high enough that the exemption will not benefit your tax return, you may choose to give the dependency exemption to your spouse or release it completely. On a normal tax return for a couple filing jointly, you must report all gross income including that from dividends, joint asset interest, and property income. However, after divorce, if each spouse has an equal right to the property income, typically one-half of the income from the property is properly taxable to each spouse. When it comes time to divide deductions, you will need to show that you can claim the itemized deductions that you actually paid. This can be difficult to keep track of if you paid the majority of your expenses out of joint accounts. Again, determining who gets certain deductions may be easier when one spouse is the main income earner. There is no room for guesswork or hoping the IRS will not catch discrepancies when filing taxes for the first time after a divorce. To prevent any blemishes on your tax records, make sure you seek professional help from a tax consultant or certified public accountant. For help with property division and re-establishing your financial stability, attorney David Ward is here to help. Call 770-383-1973 or fill out our contact form to request a REAL Case Analysis to learn more about your options for protecting your financial status following divorce.